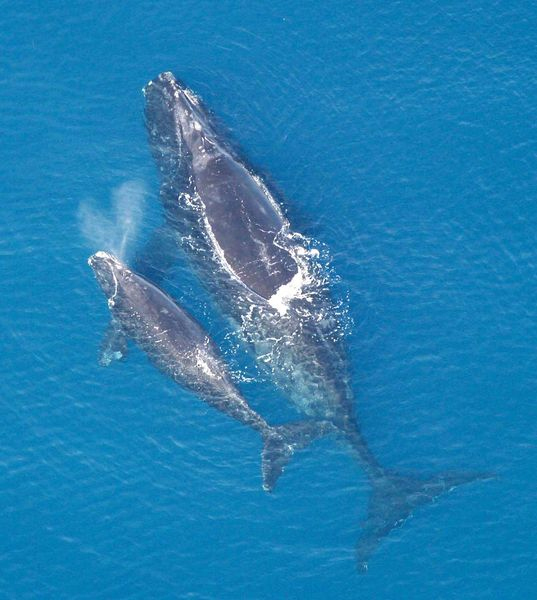 Right whale mother and calf (public domain photo on Wikipedia). The right whale's existence has been threatened since it was named "right whale" by whalers about 800 years ago (the "right" whale to hunt because they swim slowly, close to the surface, close to shore, and float when killed because of the abundant blubber). The whale's oil was used in lamps and perfume; their baleen for buggy whips, umbrella ribs, corset stays, hair brushes, and many other articles. The baleen alone on a right whale could make a voyage profitable for the whalers. By the late 1800's there were so few right whales left that hunting them was not profitable, and today it is critically endangered with only about 350 left. Some scientists believe they will not escape extinction. Although hunting the northern right whale has been illegal for almost 100 years, their numbers are not increasing. Because they swim and rest very close to the surface, many are killed by colliding with ships. Fishing nets are also a serious hazard. Some scientists also believe that the pollution in the ocean is affecting the growth of the krill and plankton on which they feed. Add to all this the fact that a female Right whales give birth every three to five years to a single calf. Whales are divided into two groups; toothed whales (odontoceti) and baleen whales (mysticeti). Toothed whales eat fish,squid, octupus, and other sea creatures and have one blowhole. The largest toothed whale is the sperm whale which grows to about 50-60 feet long. Baleen whales are larger than toothed whales and have two blowholes. The largest baleen whale is the blue whale which is the largest animal that has ever lived on earth (with length up to 110 feet and weighing up to 174 Tons). A Northern right whale (Eubalaena glacialis glacialis) grows to about 50 feet long and weighs about 120,000 pounds. Southern right whales (Eubalena glacialis australis) are a little larger, growing up to 54 feet long. In both species the male is slightly smaller than the female. The Northern right whale (like all baleen whales) is a seasonal feeder that filter feeds crustaceans and plankton from the water. Baleen whales have baleen plates instead of teeth. Baleen is made of keratin (the same substance as fingernails); in the case of the northern right whale baleen hangs in a comb-like series of bristles up to 9.5 feet long from the upper jaw. The northern right whale swims slowly with it's mouth open while the baleen filters the krill (small shrimp-like crustaceans), plankton (plankton is made up of many tiny plants and animals), and capepods (also tiny crustaceans) from the water. Alaska also has a filter feeding whale as the state marine mammal (bowhead whale). 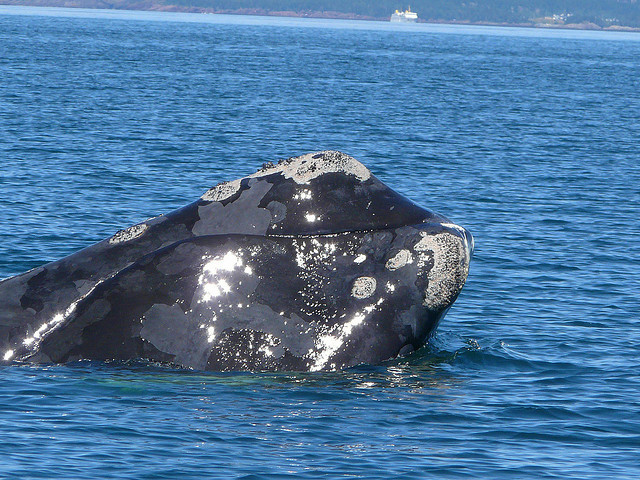 Right whale; photo by Head Harbour Lightstation on Flickr (noncommercial use permitted with attribution / no derivative works). Right whale / human size; image by Chris huh on Wikipedia (use permitted with attribution / share alike).